The Wechsler Intelligence Scale for Children: Fourth Edition (WISC-IV) is one of the most often used measures to assess intelligence and cognitive functions in children, ages 6-16 years. The second edition of the WISC-IV Clinical Assessment and Intervention will include new information obtained from the clinical use of the WISC-IV in practice. 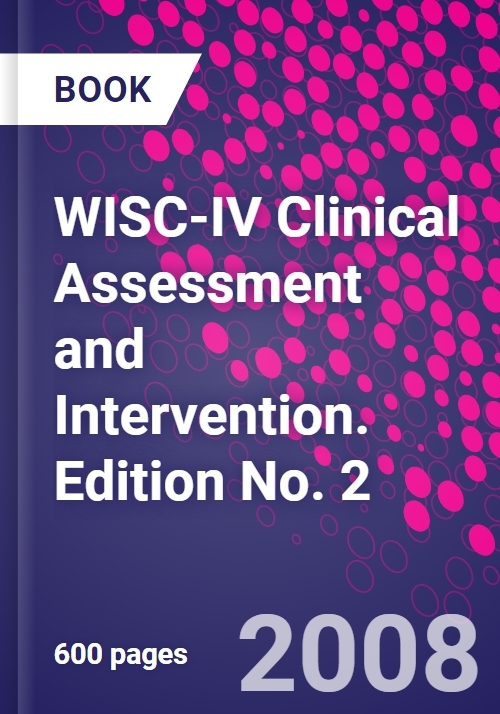 Information on the basic use of the assessment tool is condensed from three chapters into one, with four new chapters discussing how to use and interpret WISC-IV with additional clinical populations. These new populations include pervasive Developmental Disorders including autism, Social and emotional disorders, psychiatric disorders, and medical disorders that may affect intelligence. An additional new chapter discusses intervention planning across patient populations. Each of the chapters (revised original chapters and new chapters) will additionally include case studies including diagnosis and intervention. Overall, the material in the book is 65% changed, new, and updated. These changes make the second edition better able to meet a clinician's needs in using and interpreting this test. Dr. Saklofske is a Professor in the Division of Applied Psychology at the University of Calgary. He is also an Adjunct Professor at the University of Saskatchewan and Swinburne University, Australia. He is a Fellow of the Canadian Psychological Association and the Association for Psychological Science. Dr. Saklofske has published more than 150 journal articles and book chapters on intelligence, personality, individual differences and psychological assessment. As well, he has written or edited books on the Wechsler intelligence scales, personality and intelligence, exceptional children, and educational psychology. He is the Editor of the Journal of Psychoeducational Assessment and the Canadian Journal of School Psychology and Associate Editor of Personality and Individual Differences. Lawrence G. Weiss, PhD is Vice President of Test Development for Pearson Clinical Assessment. He oversees a department of 150 professionals and is responsible for all research and test development activities related to the company's psychological, educational, speech, language, and occupational therapy assessment products as well as post college admissions tests. He also advises on test development activities for the company's international business partners around the globe including Pearson Clinical Assessment offices in the United Kingdom, Australia, Canada, France, Germany, The Netherlands, India, China, Spain, and Brazil. . . Dr. Weiss has presented widely on intelligence in more than a dozen countries. He has authored or co-authored the following 7 graduate level text books: . . .	WISC-III Cross Cultural Analyses: Culture and Children's Intelligence (2003) . .	WISC-IV Clinical Use and Interpretation (2005) . .	WISC-IV Advanced Clinical Interpretation (2006) . .	WISC-IV Clinical Use and Intervention (2008). .	WAIS-IV Clinical Use and Interpretation (2010). .	BAYLEY-III Clinical Use and Interpretation (2010). .	Advanced Clinical Assessment with WAIS-IV and WMS-IV (2013). . Some of his books have been translated into Spanish, Japanese, and Korean. In addition, he has authored or coauthored approximately 30 journal articles, 12 technical reports, and 10 other book chapters.. . Dr. Weiss holds a PhD degree in industrial and organizational psychology from Texas A&M University, and a master's degree in clinical psychology from Trinity University. He lives in San Antonio, Texas, with his wife of 28 years, Judy Ann. The Weiss' have two adult sons.